Snippets of Jack: "You've Seen It All, Done It All"
"You've Seen It All, Done It All"
HAPPY BIRTHDAY JOHNNY DEPP!!! If you don't know who Johnny Depp is, you are having serious problems and I'm not really sure why you are on this blog. But if you do know who Johnny Depp is, then you are aware that be plays our dear friend Captain Jack Sparrow, and does a pretty good job at it also. So on today, June 9, 2012, Johnny Depp turns 49! (Even though he looks about fifteen years younger.) I shall now share with you my favorite movies Johnny Depp starred in in honor of his awesomeness. Have you ever wondered where snow comes from? 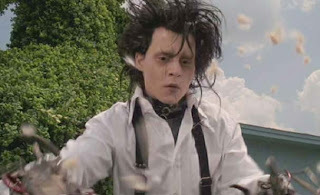 Well, according to this film directed by Tim Burton, snow comes from the mysterious Edward Scissorhands, played by Johnny Depp of course, who uses his hands of scissors to shave ice, letting it fall round the city. Edward was created by a scientist, who died before finishing his hands, so Edward must survive using scissors. A nice young lady finds him living all alone and takes him in to live with her family. At first, Edward becomes a sensation in this suburbia, cutting people's hair and doing their lawn. But Edward gets himself into trouble helping the teenage daughter of the family and must return to his secluded home, where he shaves the ice. 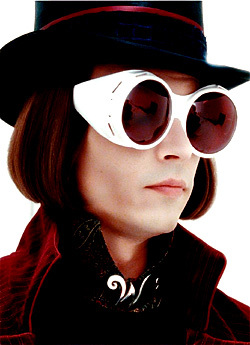 Johnny Depp plays the wonky Willy Wonka in Tim Burton's adaptation of the children's story by Roald Dohl. If you haven't read the book or even seen one of the movies, then you really did not have a very good childhood. I'll enlighten you now, because it's never too late to learn. Willy Wonka runs a huge chocolate factory but doesn't let anyone in. Suddenly, there is an announcement for a contest that for one day only five children may take a tour of the factory if they find a golden ticket. Charlie Bucket finds a golden ticket and enters into the awesome factory. Charlie then realizes upon his tour that Willy Wonka has chosen him to run the factory when Mr. Wonka is gone. But of course, Tim Burton adds an extra spin by revealing Willy Wonka's troublesome past. 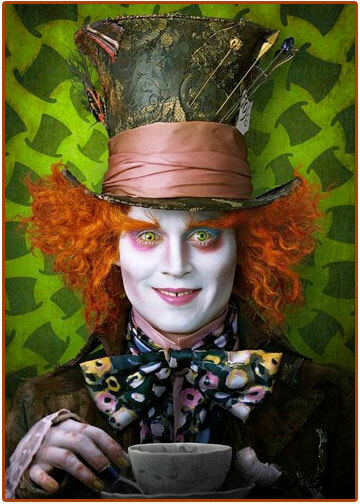 The birthday boy stars in Tim Burton's Alice in Wonderland (Johnny Depp is in like half of Tim Burton's films, if you haven't realized) as the Mad Hatter. Alice falls through a whole and finds herself in Wonderland. After encountering quite a few other odd characters, she meets the Mad Hatter. The Red Queen is out to get Alice though and the Mad Hatter saves her life by shrinking her and throwing her in his hat. Alice returns the favor by later saving him from the Red Queen. Together they team up with the rest of Wonderland to end the tyranny of the Red Queen. If you haven't noticed, I love The Pirates of the Caribbean series. If it wasn't my favorite, then I guess this website would be called: snippetsofedward.blogspot.com or snippetsofwilly.blogspot.com. But it's not because Will Turner, Elizabeth Swann, Hector Barbossa, Angelica, Joshamee Gibbs, and of course Captain Jack make every movie thrilling, funny, and entertaining. Usually, Disneyland makes rides from their movies, but for Pirates, they based the movies off of the rides. Johnny Depp voices Jack Sparrow on the rides and video games also. 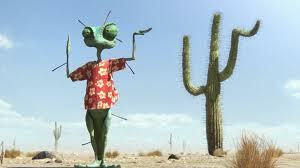 The first movie was a huge success at the box office, which most people creditted to Johnny Depp, who was nominated for an Academy Award for best actor as Jack. Johnny Depp said that Jack Sparrow is apart of him and he plans to play him in all of the future films. Hopefully he will return in a fifth Pirates of the Caribbean movie! First I must say, that first image(collaging Sweeney Todd, Jack Sparrow, Mad Hatter, and Willy Wonka) is just magnificent. I'm curious, did you do it yourself or found it somewhere online? If interested, please let me know if you accept this or not. Oh, and also provide an image(at least 250x65) as for use to link to this site with. Thank you for your time in viewing our blog! It's nothing close to Pirates Wikia but we have lots of fun making it. Snippets of Jack is co-authored by two people. We would love to be an affiliate for Pirates Wikia, since we are on it a lot anyways. We will look into that as soon as possible. Also, thank you for your interest in the picture. As much as I'd like to take credit for it, I found it on the internet. If you have any questions about being affiliated, you can either ask me here or contact me down at POTC Wiki...whichever floats your boat(no pun intended lol). Is there anything we need to do to become an affiliate other then providing a picture? Not really. The way we pick affiliates(er, how "I" do it, as the affiliates were pretty much my idea lol)...is by picking sites that are dedicated to some manner of the POTC franchise, whether it is for the ride, the movies, or if it's related to someone involved(we have Terry Rossio's website in our affiliates). The only thing we require from our affiliates is a picture, preferably at the size 250x65, but any size similar to our other affiliates would do(check out the affiliate page, which I linked above, to see the images used for those sites). And we would use the image for linking to this site with. Okay! Thank you! Can we email you this picture? where should we upload it to? Just upload it to the Wiki in general(don't worry, it'll be placed where it needed be)...go there and click on the "Add a Photo" button and upload the image. Though you have to create an account, which I believe you already did. Having said that, Welcome to POTC Wiki! So we uploaded it, it doesn't seem to have been placed on the affiliates page. 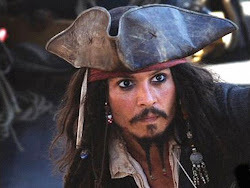 I love Captain Jack Sparrow, and ALL of the Pirates of the Caribbean films are THE BEST FILMS ON EARTH! and I agree that Johnny should return as Captain Jack! Hmm, maybe stealing a ship.haha or just doing something outrageous. Thanks for reply`n! I was just wondrering, do you know anything about the 5th Pirates of the Caribbean movie that might be interesting?? I tried to find out stuff over the internet but i couldn`t find out much. P.S Are you a girl or boy that set up this page??? I dont know much, but this site http://pirates.wikia.com/wiki/Main_Page has a ton of info about the other movies so i would check there. Captain Jack Sparrow is AWESOME! Anyone who says otherwise is a DISGRACE! Who could possibly say anything bad about Johnny Depp or lovable Jack?! cοnѕtantly thіs wеblog аnd I'm impressed! Extremely helpful information particularly the last phase :) I deal with such info much. I was seeking this particular info for a long time. Thank you and good luck. Hello There. Ι founԁ уour blοg usіng mѕn. іnfo. Thаnks fοr the ρost. I'll certainly comeback.